She'll be an intant classic in this Moschino Kids® Short Sleeve Victorian Graffiti Graphic T-Shirt. Crew neckline. Short sleeves. Victorian Graffiti graphic print along the front. Pull-on construction. Straight hemline. 95% organic cotton, 5% elastane. Machine wash cold, dry flat. Imported. This item may ship with an attached security tag. Merchandise returned without the original security tag attached or a damaged tag may not qualify for a refund. Measurements: Length: 21 1⁄2 in Product measurements were taken using size 8 Big Kids. Please note that measurements may vary by size. 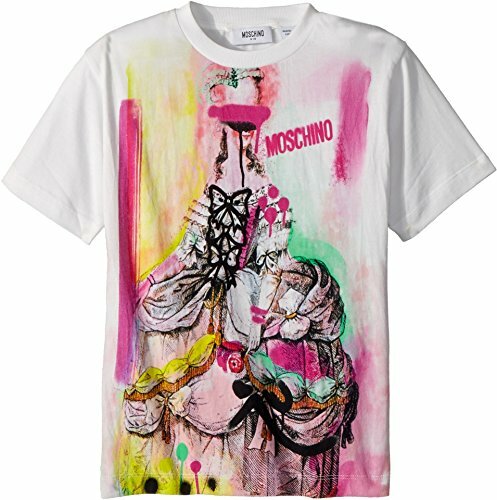 She'll be an intant classic in this Moschino Kids® Short Sleeve Victorian Graffiti Graphic T-Shirt. Victorian Graffiti graphic print along the front. Pull-on construction. Straight hemline. 95% organic cotton, 5% elastane. Machine wash cold, dry flat. Imported. This item may ship with an attached security tag. Merchandise returned without the original security tag attached or a damaged tag may not qualify for a refund. Measurements: Length: 21 1⁄2 in Product measurements were taken using size 8 Big Kids. Please note that measurements may vary by size.